This site has the audacity to attempt a rigorous approach to climatology. This project is not trivial at a time when climatologists are closing in their certainties that have been forged from approximations, sometimes crude, in the interpretation of observed phenomena. So much so that it is often difficult to distinguish scientific advances from fantasies, this confusion being maintained by media coverage involving the most prestigious scientific journals. The different scenarios oscillate between a hot or cold future according to the good will of the Gulf Stream. This warm current would threaten to stop due to the melting of the pack ice that would compromise the thermohaline circulation resulting from an increase in the density of seawater at the approach of the polar caps. But what about the Kuroshio, the equivalent of the Gulf Stream that circulates off the coast of Japan while the Pacific is virtually closed to the north by the Bering Strait? It is because forces acting on a planetary scale come into play under the combined effect of gravity and rotation of the earth.This finding does not obscure the prominent role of the ice edge on the speed of the western boundary currents, but by exerting a negative feedback like what happened throughout the Holocene. Climatology is a young discipline, indeed, the essence of which remains to be discovered. The warming observed since the beginning of the industrial era is a reality, but the part attributable to human activities, to the emission of greenhouse gases in particular, is poorly known. For the climate has always varied over time, which is confirmed by the archives obtained from ice or sediments cores, the first collected in the polar caps and the second in the ocean trenches. Moreover, the evolution of the global surface temperature of the earth since the beginning of the industrial era is difficult to grasp, with the required precision. The estimates made a few years ago, which showed a slowdown in global temperature growth starting from the end of the 20th century, the famous ‘hiatus’ which seemed to call into question any causal relationship between the growth of greenhouse gases and its assumed effects have been invalidated and replaced by more representative measures. The CRU (Climatic Research Unit, University of East Anglia) has made a retrospective correction by integrating more data, including the Russian Arctic, now showing a continuous increase in temperature (Jones et al., 2012). These uncertainties, not to mention the images of pure communication that proved to be untrue, fuel a certain skepticism aimed at calling into question the methodological approach of the Intergovernmental Panel on Climate Change (IPCC). What was only a precautionary principle became a reality. Supporters of catastrophic scenarios now speak of consensus to support their assumptions, which goes against any objective approach: the term global warming has given way to climate change following the disappointments of forecasters. On the other hand, denying or minimizing by pure egocentrism or on the basis of fallacious pseudo-scientific arguments, the anthropogenic impact on the increase of CO2 in the atmosphere as well as its climatic incidence would raise an irresponsible arrogance (Pinault, 2018e). Because the impact of human activities on global warming is undeniable and can now be evaluated objectively thanks to recent work on the resonance of ocean gyres under the influence of solar and orbital forcing. More than half of the warming observed since the beginning of the industrial era is attributable to humans. The average temperature of the earth’s surface has increased by 0.8 ° C in 50 years, linearly. No inflection is perceptible, which suggests the inexorable continuation of this rise over the next decades if the production of greenhouse gases continues to increase at the frenetic pace we are currently experiencing. This apparently low temperature rise has however an important climate impact because of the increase in energy available to supply cyclonic and anticyclonic systems, leading to more extreme events. Nothing like this has been observed so quickly during the Holocene covering the last 12,000 years of our history. The purpose of this article is not to make shattering revelations, let alone feed new controversies. It reinforces the growing awareness of global stakes in the light of the author’s scientific publications on medium and long-term climate variability. For it is here that knowledge is most lacking to unambiguously separate natural variations in climate from those related to human activity. A long adventure has led the author to patiently and methodically dissect the mechanisms involved. Using satellite data on the variation of the height and temperature of the oceans, isotopic analyzes of ice and sediment cores, new concepts on ocean dynamics and climate variability have been established. Our ignorance of the mechanisms controlling climate variability results from the fact that research has mainly focused on atmospheric phenomena over the last few decades, whether they refer to human activities or solar cycles. But the driver of climate change is not the atmosphere but oceans, the atmosphere playing only the role of vector between oceans and continents, like the El Niño phenomenon (Pinault, 2016). The oceans resonate with solar and orbital cycles, storing or on the contrary restoring heat: the resonance called “gyral” because occurring around the five subtropical gyres, closely affects the energy balance of our planet. The amplifying effect of solar and orbital forcing comes from the positive feedback exerted by the geostrophic current (resulting from the combination of gravity and inertial forces due to the rotation of the earth) of the gyral Rossby wave: the oscillation of the thermocline is amplified by the geostrophic current which warms or cools, as the western boundary current accelerates or slows down. Thus, the modulated response of subtropical gyres helps explain, through observations and based on irrefutable physical basis, climate change at different time scales (Pinault, 2018d). Based on this new phenomenon, this article discusses climate variability with fresh eyes while solving some puzzles on ocean circulation. 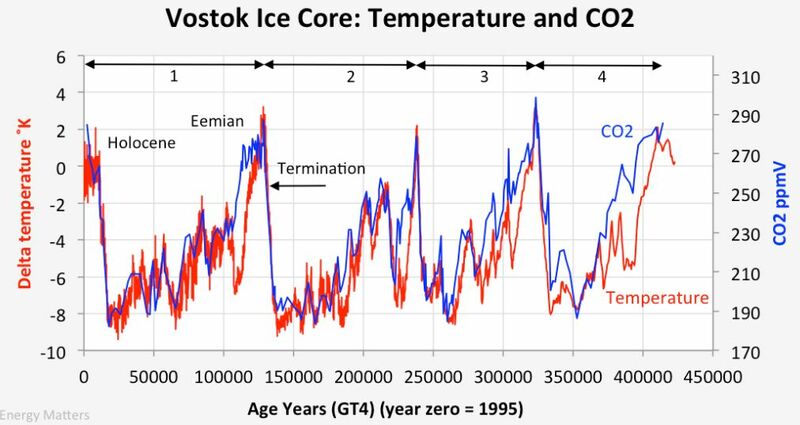 Global temperature and carbon dioxide concentration in the last four glacial-interglacial periods derived from the analysis of ice cores (Vostok, Antarctica). The offsets in time observed between the two curves are measurement artifacts. From proxies derived from ice cores taken from the polar ice caps, the observed correlation between global surface temperature and atmospheric CO2 over the last four glacial-interglacial periods shows that it is the rise in temperature which increases the CO2 in the atmosphere ( by degassing oceans mainly) and not the reverse, since the observed cycles are the result of orbital forcing (Milankovitch cycles). This process is still valid today but not noticeable yet because changing equilibriums of the mixed layer of the ocean requires several hundred years. By contrast the emission of combustion gases has a faster effect on the global temperature by radiative forcing. 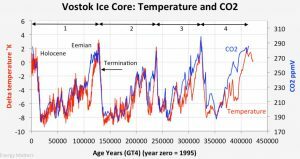 Solar activity over the past 11,400 years has been reconstructed by analyzing jointly the concentration of radiocarbon in tree rings and isotopic abundance of beryllium-10 in ice cores. 14C and 10Be isotopes, which are produced by cosmic rays in the upper atmosphere, indeed reflect solar activity because in periods of high activity cosmic rays are deflected in the solar system and therefore produce less cosmogenic isotopes. The reconstruction of solar activity shows that it varies continuously. 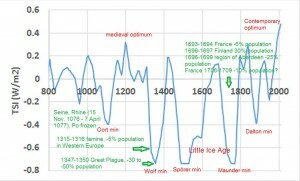 During the last millennium, humanitarian disasters generated during periods of low activity suggests that the global temperature has dropped, as was the case during the last Little Ice Age: there is undoubtedly a causal relationship between solar activity and global temperature. How can the 11-year cycle, during which solar activity varies of a few tenths of a percent, be so quiet? Although low, this amplitude is of the same order as that of longer cycles. But this 11-year cycle has little influence on the climate compared to Milankovitch cycles, of very long-periods, which reflect the variations in the orbital parameters of the earth around the sun. Those have a significant impact, setting periods of glaciation, in particular. This selectivity and the variability in the efficiency of solar and orbital forcing during glacial-interglacial periods highlighted from the analysis of ice cores originating from Greenland and Antarctica suggest that resonance phenomena occur, filtering out some frequencies in favor of others while amplifying or mitigating according to the extension of the polar caps. Is that the tropical belt of the oceans produces long-waves, whose wavelength is several thousand kilometers. Trapped by the equator due to the Coriolis force resulting from the earth’s rotation, they are deflected at the approach of the continents to form off-equatorial waves. These long tropical waves resonate with the forcing exerted by trade winds, whose period is annual, to produce sub-harmonic whose period is multi-annual. These long-waves that oceanographers appoint of the name of baroclinic result of the oscillation of the thermocline one hundred meters deep or more that separates the warm surface waters from deep cold waters, denser. This tropical oceanic resonance is one of the drivers of ocean surface circulation, i.e. above the thermocline, and contributes to the formation of strong western boundary currents such as the Gulf Stream in the North Atlantic and the Kuroshio in the northeast Pacific, by introducing a sequence of warm or cold waters according to the oscillation of the thermocline. Around latitude 40°N or S, those western boundary currents, which flow poleward in both hemispheres, leave the boundary of the continents to join each of the five oceanic subtropical gyres, giant vortexes at the north and south Atlantic and Pacific oceans and the southern Indian ocean. These resonantly forced baroclinic waves then become gyral, suiting their wavelength to the period inherited from the tropical oceans. For periods between half a year and eight years, the forcing of these gyral Rossby waves is induced from the sequence of warm and cold waters conveyed by western boundary currents, and now cause the oscillation of the thermocline of the gyre. But these gigantic gyral Rossby waves also have the ability to tune with the long-period solar cycles of one to up to several centuries, as well as Milankovitch cycles that affect the occurrence of glacial and interglacial periods, which reflect the changes in terrestrial astronomical parameters throughout tens of thousands of years. These resonant baroclinic waves have the ability to ‘hide’ the thermal energy that drives them by lowering the thermocline; due to a positive feedback those warm deep-waters favor the acceleration of the western boundary current and the development of sea surface temperature anomalies, supporting the heat exchanges between the ocean surface and the atmosphere: thermal surface anomalies induce atmospheric instabilities say again baroclinic, depressions or cyclones, which, carried by the jet-streams at high altitude, travel throughout the continents. In this way, surface temperature of continents respond to thermal anomalies of subtropical gyres. Positive or negative according to the motion of the thermocline, these thermal anomalies of sea surface, which result from the remanence of the vertical thermal gradient, tend to produce the same anomalies at the surface of continents. This because of the cyclonic or anticyclonic activity of the atmosphere stimulated at mid-latitudes. This thermal balancing internal to our planet, which occurs over the years, smooth the climate variations we observe daily at mid-latitudes. The imbalance between the energy received and re-emitted by the earth mainly depends on the depth of the thermocline of gyral Rossby waves. To understand the modulated response of subtropical gyres, driver of mid- and long-term climate variability and its coupling with the solar and orbital cycles, first we have to focus on the resonance of oceanic tropical waves from which are inherited periods of resonance. The study of the baroclinic quasi-stationary waves in the three tropical oceans consists in bringing out sea surface height anomalies and modulated currents in characteristic bands such as the 8-16 month band for annual waves. From measurements of sea surface height are deduced the amplitude and phase of sea surface height anomalies, but also the speed and phase of the modulated geostrophic currents from the slope of the sea surface, thanks to the use of cross wavelets. Quasi-Stationary-Waves are formed, representing a single dynamic phenomenon within a characteristic bandwidth. Geostrophic forces closely constrain the behavior of the baroclinic waves at the limits of the basin, forming antinodes at the place of Sea Surface Height anomalies and nodes where modulated geostrophic currents ensure the transfer of warm water from an antinode to another. Modulated geostrophic currents that change direction twice per cycle, are superimposed on the wind-driven current. Although these terms node and antinode are abusive because the phase of Quasi-Stationary-Waves is not uniform, which may involve overlapping of nodes and antinodes, they explicitly reflect the evolution of the wave during a cycle. To the 5 subtropical gyres correspond 5 western boundary currents that are the Gulf Stream and the Brazil Current in the North and South Atlantic, the Kuroshio and the eastern Australian current in the North and South Pacific, the Agulhas in the South Indian Ocean. Under the influence of resonantly forced baroclinic waves, the three tropical oceans feed those western boundary currents through a sequence of warm and cold waters to one cycle every 1/2, 1, 4 and 8 years. Tropical oceans behave indeed as “resonators” under the effect of forcing due to surface stress and ENSO as regards the Pacific. In fact, during these cycles the temperature of the water carried by the western boundary currents does not change, or very little. The wavelet analysis of the sea surface temperature does not show anomalies in the different characteristic frequency bands. It is the depth of the thermocline that varies, thus the warm water mass transported poleward, without generating the formation of baroclinic waves that, facing west, would inevitably be wiped out against the coasts. This is no longer true when the western boundary current reaches a latitude nearby 35° to 40°N or S. At high latitudes, the velocity of the western boundary current increases as the phase velocity of the baroclinic waves decreases: baroclinic waves are formed when the velocity of the western boundary current becomes higher than their phase velocity. More precisely, the western boundary current becomes unstable when its speed is higher than the phase velocity of Rossby waves, this condition inducing a resonance. Any obstacle causing the current to move away from the coast leads to the formation of quasi-stationary Rossby waves, either because of the line of the coast or the collision with a current flowing in the opposite direction along the coast: the western boundary current orientates gradually eastwards while Rossby waves propagate in the opposite direction. The gyral and tropical resonance producing positive or negative surface temperature anomalies these can induce high and low atmospheric pressure systems that affect the climate globally. To quantify the energy transfer from the thermal anomaly to the continents, the unperturbed state of the system in the absence of thermal anomaly resulting from the resonance of baroclinic waves has to be considered at first, which implies that the average energy captured by the earth is completely re-emitted in space. This is only true if the energy transfers are averaged over one or even several years to remove fingerprints of phenomena not linked to the resonance of baroclinic waves, which cause an imbalance in energy budget during the annual cycle: this is the case, for example, of the formation of sea ice during the winter and its melting during the summer. Then, the perturbed state resulting from the imbalance in energy budget due to heat transfer toward high latitudes of the gyres behaves, which concerns ocean–atmosphere exchanges, like a quasi-isolated thermodynamic system. This is because thermal exchanges are mainly ruled by latent and sensible heat fluxes. Indeed, the difference in radiative fluxes between the surface of the gyres and that of the surrounding ocean is very low in comparison with other heat fluxes. This implies that the heat dissipated at the ocean–atmosphere interface at mid-latitudes is conserved on a planetary scale. Compared to the undisturbed system, the perturbed state of the system tends to a new steady state in which a new thermal equilibrium occurs between the sea surface perturbation ΔT and the continents. Due to its persistence, which reflects the renewal of the mixed layer at high latitudes of the gyres while maintaining the vertical temperature gradient, ΔT tends to balance with the surface temperature perturbation of the continents. Although the areas covered by oceanic thermal anomalies are small compared to the ocean surface, they generate atmospheric baroclinic instabilities that have a key role in the transfer of heat between the oceans and continents. However, the mechanisms involved differ depending on whether one considers the tropics or mid-latitudes. As we will see by referring to the rainfall oscillation in the band 5-10 years, thermal transfer, positive or negative, between the anomalies resulting from the resonance of baroclinic waves and impacted continental régions is performed in two main ways (Pinault, 2018a). On the one hand the oceanic temperature anomalies at mid-latitudes deflect tropical cyclones to mid-latitudes or otherwise confine them within the tropical belt according to the sign of the anomalies. On the other hand they promote depressions, anticyclones and troughs at mid-latitudes, these atmospheric phenomena being aroused under the effect of the polar or sub-tropical jet-stream. In all cases, atmospheric baroclinic instabilities may generate heat transfers to the synoptic scale, mainly in the form of latent heat. To highlight how some land areas are affected by atmospheric baroclinic instabilities induced by thermal anomalies resulting from the resonance of baroclinic waves, it is convenient to use monthly rainfall height data which are known since 1901 on the terrestrial scale. Indeed, heat transfer from the oceans to the continents mainly resulting from processes of evaporation and condensation according to what has been seen previously, how rainfall varies over time characterizes the impacted areas. In many cases paleoclimatology is still at the stage of speculating what may have been the underlying causes of rapid climate transitions, cycles and forcing effects. This leads us to how the climate system responds to external stimuli with its own dynamics. When the internal dynamics of the climate system is consistent with an external stimulus, a resonance phenomenon occurs. The study of such resonances therefore tells us about the internal dynamics of the Earth system, spearheading our understanding of the mechanisms involved in vagaries of climate. Understand the vagaries of climate becomes possible from the archives of past climate. We have, in fact, over a few decades data of exceptional quality for tracing the climate up to several million years before present (BP), with a resolution of a few years. This technological feat was made possible through the analysis of stable isotopes in ice cores from the Arctic and Antarctic ice caps and in sediment cores from the ocean trenches. The analysis of ice cores plays a key role in understanding the different mechanisms involved in the natural evolution of climate over the last major cycles of glacial and interglacial periods. The oldest records obtained to date cover 800,000 years, the second half of the Quaternary. Deuterium data 2H obtained from Antarctica Dome C ice core (European Project for Ice Coring in Antarctica EPICA) are used for global mean temperature estimate in the southern hemisphere [Jouzel et al, 2007]. 18O data obtained from Greenland Summit Ice Cores GISP2 (Greenland Ice Sheet Project 2 Ice Core), Grootes and Stuiver,  are used as proxies of global mean temperature in the northern Atlantic [Jouzel and Merlivat, 1984]. Sediment cores allow the study of the composition of the different layers of sediment accumulated over time on the ocean floor. There are fossil microorganisms composed of calcium carbonate. By studying the “abundance ratio” of 18O and carbon isotope 13C, past climates can be reconstructed going back millions of years. They establish how the oceans have evolved in different climatic periods (temperature, salinity, nutrients, …). The climate during Holocene, which began with the interglacial period about 12500 years ago, can be studied from proxies of solar irradiance and Earth’s average temperature in both hemispheres. From the coupling between solar irradiance and global mean temperature will be deduced information about the internal dynamics of the climate system. Furthermore, superimposed on oscillations are several distinct climate steps which appear to be of widespread significance, the most prominent being observed 8.2 Kyr, 5.5-5.3 Kyr and 2.5 Kyr (Kyr=103 years) BP. These events, which are recognized as part of the millennial scale quasi-periodic climate changes, alongside the Dansgaard–Oeschger (D-O) cycles, and are characteristic of the Holocene [O’Brien et al, 1996; Bond et al, 1997; Bianchi and McCave, 1999; de Menocal et al, 2000; Giraudeau et al, 2000]. Although the study of Holocene alone brings key elements necessary for understanding current climate variability, new properties of gyral resonance emerge when looking at the glacial-interglacial era, properties that will allow us to raise some mysteries surrounding the climate of the past few million years. As for the Holocene, the comparative study of Earth’s average temperature and solar irradiance can be carried out to deduce the efficiency of orbital forcing onto the gyral resonance. The Earth’s average temperature can be inferred from the sediment core records after they have been calibrated relative to ice core records. Orbital forcing is calculated from the Milankovitch parameters (Berger, 1992). Climatology is a young science. Most climate-impacting mechanisms are poorly understood, whether natural or man-made. The way in which solar and orbital cycles influence the surface temperature of our planet remains one of the greatest mysteries since Milankovitch’s work. This article attempts to provide some answers by invoking a hitherto unknown phenomenon, which is the resonance of gyral Rossby waves. As far as anthropogenic impact is concerned, much research is still needed to understand the mechanisms of amplification of the greenhouse effect. The cumulative effect of greenhouse gases on the surface temperature is very low compared to the average temperature measurement results whose anthropogenic component has been increasing linearly since the 1970s by 0.8 to 1 ° C in 50 years. This assumes a strong positive feedback of the greenhouse effect on the global temperature. Taking into account the natural component of the surface temperature makes it possible to accurately determine the anthropogenic component obtained by subtracting the natural component of the surface temperature measured from the terrestrial meteorological stations or from satellites. The great disparity in the spatial distribution of temperature variations of anthropogenic origin suggests that the adiabatic lapse rate plays an essential role and, with it, the behavior of high altitude clouds at the edge of the troposphere. One of the most important consequences of global warming is melting the polar ice. This is followed with the greatest attention. In particular, the satellite measurement of the concentration of sea ice by microwaves provides relevant information on the temporal evolution of the polar ice: the amplitude of the variations in the percentage of ice highlights the most impacted areas. The study of resonantly forced planetary waves of very long wavelength, which has been ignored so far, is promising in physical oceanography and climatology. This may be a step forward in the areas that are still poorly understood, such as the formation and stability of the subtropical gyres and long and very long-term climate variability, citadels that remained invincible for more than half a century and therefore, can be overcame only by using new concepts. This article provides a physical basis for a resonant phenomenon that many researchers have foreseen for a long time, allowing to explain how the efficiency of solar and orbital forcing could vary by a factor of 5 during glacial-interglacial periods, as well as the contribution of the natural variability in the global warming that prevailed since the beginning of the 20th century. The natural variability of the mean temperature initiates a decrease due mainly to the harmonic of gyral Rossby waves of 64 year average period. However it remains low (a few tens of degrees) compared to the anthropogenic component and cannot be enough to reverse the trend. The warming observed since 1970 is mainly attributable to human activities, the evolution of which will be decisive in the coming decades. No inflection is perceptible on the growth curve of the last 50 years, everything suggests that the mean temperature will increase by nearly 1 ° C over the next 50 years if the rise in production of greenhouse gases does not weaken. Taking into account the natural variability of the climate in the warming confirms the importance of the anthropogenic impact and specifies its evolution. A lot of work remains to be done, but we hope that this article will help lay new bases for specifying and anticipating the future climate. Svensmark H. (2007). “Astronomy & Geophysics Cosmoclimatology: a new theory emerges”. Astronomy & Geophysics 48 (1): 1.18–1.24. doi:10.1111/j.1468-4004.2007.48118. 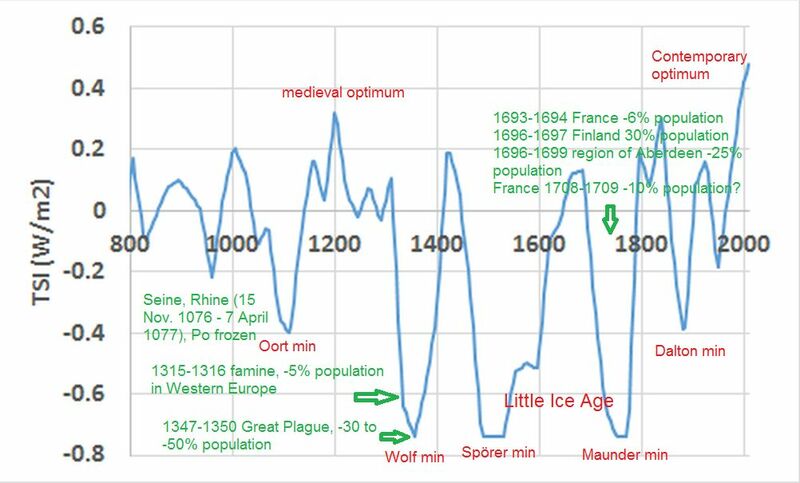 Dansgaard–Oeschger events (often abbreviated D–O events) are rapid climate fluctuations that occurred during the last glacial period. The term stable isotopes usually refers to isotopes of the same element. The relative abundance of such stable isotopes can be measured experimentally (isotope analysis), yielding an isotope ratio: relative abundances are affected by isotope fractionation in nature, hence their interest in geochemistry. In meteorology, synoptic scale phenomena are characterized by a length of several hundred to several thousand kilometers and a period of several days. A standing wave is the phenomenon resulting from the simultaneous propagation in different directions of several waves of the same frequency. In a standing wave nodes remain fixed, alternating with antinodes. A quasi-stationary wave acts as a standing wave but the antinodes and nodes may overlap. Geostrophic currents are derived from measurements of wind, temperature and satellite altimetry. The calculation uses a quasi-stationary geostrophic model while incorporating a wind-driven component resulting from wind stress. Geostrophic current thus obtained is averaged over the first 30 meters of the ocean. The Coriolis parameter f is equal to twice the speed of rotation Ω of the earth multiplied by the sine of the latitude φ: f = 2Ωsin φ. The Coriolis force, on the other hand, is perpendicular to the direction of movement of the moving body. It is proportional to the velocity of the body and the speed of rotation of the medium. Baroclinic wave. In contrast with barotropic waves that move parallel to isotherms, baroclinic Rossby or Kelvin waves cause a vertical displacement of the thermocline, often of the order of several tens of meters. The seconds are usually slower than the first. Jet-streams are fast winds aloft blowing from west to east. Along a curved and sinuous path, they play a major role in atmospheric circulation as they participate in the formation of depressions and anticyclones at middle latitudes, which then move under these powerful atmospheric currents. Baroclinic instability draws energy from the portion of the potential energy available to be converted. Available potential energy is dependent upon a horizontal gradient of temperature. The conversions of energy are proportional to perturbation heat fluxes in the horizontal and vertical that, as part of this article, are related to oceanic thermal anomalies resulting from the resonance of baroclinic waves. A horizontal temperature gradient implies the presence of vertical shear. So, baroclinic instability is also an instability of the vertical shear. Western boundary currents, warm, deep, narrow and fast are formed along the western boundary of the ocean. They carry warm water from the tropics to the poles, forming the western branch of the subtropical gyres. It is the Gulf Stream (North Atlantic), the Brazil Current (South Atlantic) the Agulhas (South Indian Ocean), the Kuroshio (North Pacific), and the western boundary currents of the subtropical gyre in the South Pacific. Positive feedback loops amplify changes in a dynamical system; this tends to move the system away from its equilibrium state and make it more unstable. Negative feedbacks tend to dampen changes; this tends to hold the system to some equilibrium state making it more stable. The adiabatic lapse rate is, in the Earth’s atmosphere, the variation of air temperature with altitude (in other words, the gradient of the air temperature). Adiabatic means that a mass of air does not exchange heat with its environment (other air masses, relief). If we exclude condensation (formation of clouds and precipitation) and vaporization, the lapse rate of the atmosphere depends only on the pressure. Like any system of resonantly forced coupled oscillators, quasi-stationary baroclinic waves oscillate in subharmonic modes, whether tropical or at mid-latitude. Their coupling occurs when they share the same modulated current (the node) at the origin of the exchanges between the antinodes (where the thermocline oscillates) in opposite phase. The average period τ0 of the fundamental wave being annual according to the declination of the sun, the average periods of the subharmonics are deduced by recurrence. The period τm + 1 is deduced from the period τm so that τm+1 = nm τm where nm is an integer. The average periods of the main modes observed are 1, 4 and 8 years in the tropics (the average period of 4 years paces the El Nino phenomenon in the tropical Pacific). At mid-latitudes these are (in years) 1, 4, 8 = 4 × 2, 64 = 8 × 8, 128 = 64 × 2, 256 = 128 × 2 (solar forcing, Gleissberg cycle), 768 = 256 × 3 (solar forcing), 24576 = 768 × 32 (orbital forcing, precession), 49152 = 24576 × 2 (orbital forcing, obliquity), 98304 = 49152 × 2 (orbital forcing, eccentricity). The forcing efficiency is all the stronger as its period is closer to one of the periods of resonance of the climatic system. To the long periods corresponds an integer number of turns made by the gyral Rossby wave around the gyre (anticyclonically) during half a period. This number of turns is the subharmonic mode. For the 128 year period the gyral Rossby wave travels 2 turns except in the South Pacific where it is 1 and the south of the Indian Ocean where it is 3/2.